A Temple Owl statue and the Bell Tower on the campus of Temple University. Temple University is officially prepared to "take the next step" in its controversial quest to build a football stadium in North Philadelphia. University president Richard Englert announced Thursday that Temple will file a project submission to Philadelphia's City Planning Commission to seek approval for the multipurpose, on-campus facility. The proposed $130 million stadium has generated a sustained backlash and suspicion among neighborhood groups who fear it will negatively impact their quality of life. Stadium Stompers, the group leading the charge against Temple's plan, argues the 35,000-seat complex would bring noise, burdensome traffic and potentially more crime to the neighborhood. In February 2015, Temple's Board of Trustees approved $1 million in funding for a feasibility study to assess the environmental and community impact of the project. The university hired Moody Nolan, the largest African-American architecture firm in the United States, to conduct the study and engage with community members throughout the process. During a march down Broad Street in April 2016, protesters argued that Temple was not offering nearly enough transparency to the public and not following through with its promise to include neighbors in the discussion. By February of 2017, months after the ouster of former Temple President Neil Theobald, the university had appeared to hit the brakes on the stadium proposal. Despite budgeting $1.25 million for the feasibility study, months passed without any meaningful updates on the project. Some of the slowing momentum seemed to be an effect of former Owls head coach Matt Rhule, who led Temple to an AAC championship, leaving weeks later to accept a vacancy at Baylor University. In Temple's first season under new head coach Geoff Collins, the team went 7-6 with a bowl game victory over Florida International University. The stadium development is proposed at a site bounded by Broad Street west to 16th Street and Norris Street south to Montgomery Avenue. Officials said Thursday the site would not require any additional land and the adjacent Amos Recreation Center, owned and operated by the city, will remain open. 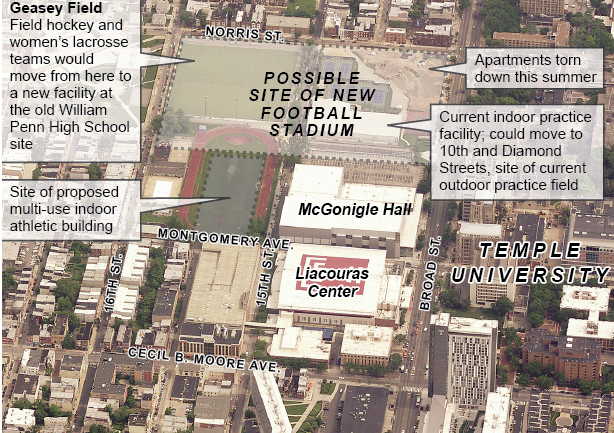 Map of proposed Temple University football stadium. Temple maintains that North Philadelphia neighbors have always been and will continue to be an integral part of the stadium conversation. Some of the university's initial planning intends to account for the concerns raised by neighbors. The university said it will organize a Special Services District around the project site to oversee dedicated maintenance and services for the benefit of the community. Designers have also been urged to minimize the impact of the facility's height, lights and noise, building the north end of the stadium no higher than the row homes on Norris Street. In its review process, the university concluded that the stadium would bring "significant cost reductions and revenue enhancements" compared to remaining in South Philadelphia. If plans were to move forward, Temple said the stadium's construction would be funded primarily by private donations bonds, which would be supported by funds diverted from the rent currently paid for the Owls' use of Lincoln Financial Field. University officials said Thursday the stadium site would include a retail component meant to turn North Broad Street into a more pedestrian-focused location. The project is envisioned as a gameday activity hub that can strengthen Temple's college community. 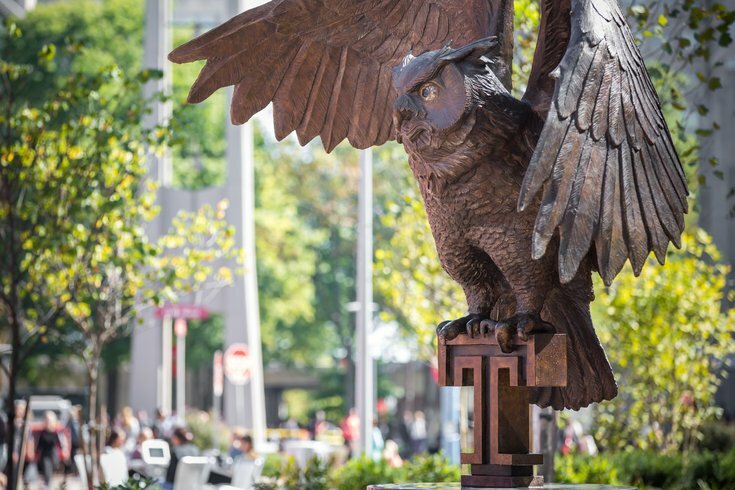 "The opportunity to explore bringing the public, alumni and fans back to campus to experience Temple’s continuing transformation is one we can’t pass up,” said Englert, who took over for Theobald at a time when undergraduate admissions were at an all-time high. “I am confident we can design and build a facility that makes sense for Temple and for the community. Our goal is to build a project that can be a source of pride for Temple, our neighbors and our city."